Drums pounding like a heart beat at the center of Chicano Park, Aztec dancers adorned with feathers and gourd rattles pound out their blessings for another year’s celebration with their feet. It has been this way since the beginning. The Aztec prayers are honored in the murals of the park by the founding artists who became danzantes in their own right, a resurgence of centuries old traditions born again in La Tierra Mia. I was 13 years old when I first donned feathers on my head and rattles on my feet for the 19th annual Chicano Park Day celebration. I nervously stood in line with other dancers, listening to stories from the elders about The Toltecas En Aztlán and the founding of Chicano Park, awaiting the sound of conch shells to tell me it was time to begin the procession. The smell of smoke and copal incense helped me to focus my thoughts and prayers and as I looked out at the cheering crowd, I raised my head high with a sense of pride, humility and honor. Present with us that day were dancers from all over the southwest, a few of them original muralists of Chicano Park, bringing our colors and rhythms to the community of Barrio Logan. It’s a beautiful feeling, looking out at elders with their grandchildren, fathers and sons in homeboy t-shirts clad with images of Cuauhtemoc and lowriders, and sharing this connection to the ancestors with them. I saw something in their eyes. I felt pride in the nod of their heads as the elders stepped one by one to the microphone to offer their prayers. I feel so fortunate to have been given the opportunity to learn about the Aztec dancing tradition from dance captain Mario E. Aguilar and his group Danza Mexicayotl, and to experience the ceremony within the context of the Chicano Park Day celebration because the two entities have always been intertwined. During the formative years of Chicano Park, a collective group of artists, poets, musicians, and dancers began to develop and eventually took the name Toltecas En Aztlán. This group was mostly comprised of students from San Diego State University, but students from other campuses and community activists were also involved. It was by chance that a teacher of Aztec dance from Mexico City, a man named Florencio Yescas, happened to cross paths with this group of activists, and influenced the process and content of the art they later created. La Danza, as it is known, and it’s spiritual connotations informed much of the mural concepts and architectural design that is seen in Chicano Park today. The Kiosco, or kiosk, at the center of the park where most of the celebratory activities are held borrows its design from ancient temples of Mexico. Gulllermo Aranda and Guillermo Rosette, two of Chicano Park’s contributing muralists, were students of Florencio Yescas during his stay here in the United States and later went on to become leaders of dance groups themselves. The influence of La Danza can be seen in the style and theme of their murals, drawing inspiration from the regalia and musical instruments the artists use first hand as danzantes. In a phone conv ersation with Aranda, he expressed that the influence La Danza has had on Chicano Park and its artists “is that it provides an underlying current of cultural pride, and images that we can project.” Before Aztec dance arrived to Chicano Park, artists would imagine headdresses or traditional garb to be a certain way, but now they had first hand knowledge at their fingertips. Guillermo Aranda and Guillermo Rosette continue to participate not only in the annual Chicano Park day celebration on Saturday, but also in the all-day ceremony on Sunday held to honor the rich traditions of Mexico, which as we all know used to be located in this very spot as recently as 165 years ago. Victor Ochoa, another contributing muralist says “La Danza nos mantiene contacto con nuestros raices”, that La Danza keeps us in touch with our roots. 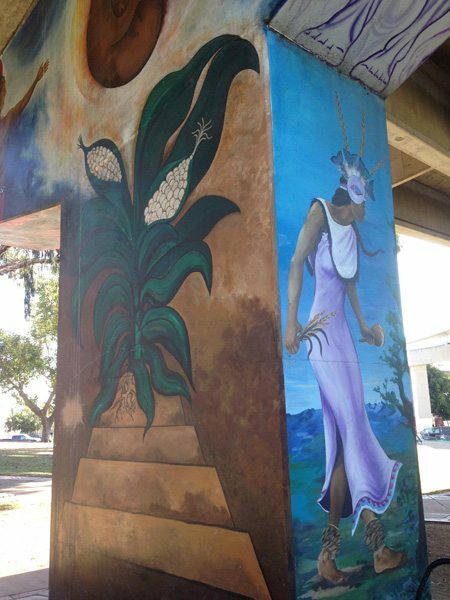 The artists have expressed themes of La Danza in their murals throughout Chicano Park using images of dancers, Aztec deities, and protagonists from Aztec folk tales like Ilhuicamina the Sky Archer to visually connect the community with it’s ancient past. The physical space of Chicano Park serves to protect and promote this rich tradition in other ways as well. Throughout the year, multiple Aztec dance groups make use of Chicano Park as host to hold regular practices in preparation for seasonal ceremonies. Day of the Dead, Xilonen –the young maiden’s ceremony, and Cuauhtemoc are just a few. These ceremonies are held in Chicano Park and hosted by local dance groups, who invite dancers from other cities such as Los Angeles, San Francisco, San Jose, Denver, Watsonville, Castroville, Taos, Phoenix and sometimes Tijuana to name a few. On occasion, dancers come from even further away. It has been an amazing journey for me, exchanging songs, prayers and dances with people from all walks of Aztlán right here in the heart of the barrio. I have danced side by side with my mother and my daughter, three generations of women continuing this precious tradition for generations to come. Our drums continue to plant seeds of cultural awareness and pride with every beat, drawing in those who come to the Chicano Park Day celebration in anticipation of a cultural experience, searching out and finding a link between past and present. 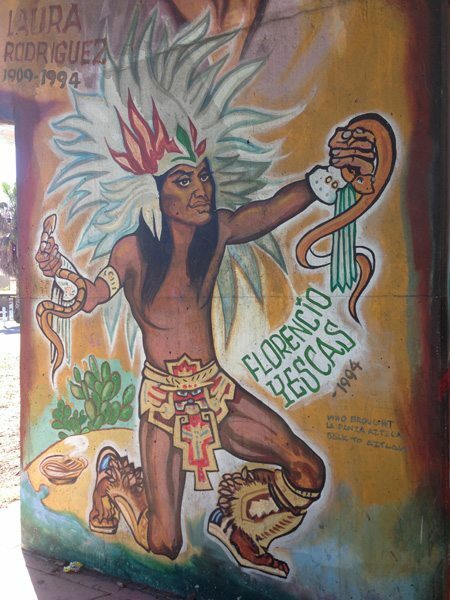 The small seed that was planted at Chicano Park in 1973 has definitely flourished, and true to the tradition of honoring history and culture artist Mario Torero created a mural commemorating Florencio Yescas for bringing Aztec dance to this community. If you come out to the celebration this Saturday, you can find it near the Senior Center on the corner of Cesar Chavez Parkway and Logan Avenue, then follow the drumbeats to Chicano Park. That is where I will be! Olympia Beltrán is a Barrio Logan denizen, artist, musician, happy wife to a SDFP columnist and mother of four who works on the cardiac care unit at Scripps La Jolla hospital. Anyone who went to the park yesterday saw a crowd of many thousands originating from Baja through this county and up, probably including El Centro, and I wouldn’t be surprised to hear from Watsonville. Wow. great article oly…. as i mentioned to you ANDRES SEGURA was the first pioneer of danza ..that came up from mexico and arrived here in san diego in the early seventies, and was a great influence of contact with our pre columbian past. andres continued to visit, bringing information and did presentations at OUR CENTRO CULTURAL DE LA RAZA and moving up to centros and groups throughout AZTLAN… i am thinking of painting a mural with his honor, could we get some memories of andres from your research? keep up the writting. Great idea, Victor! I will look through my old photos for images of Andres Segura. After some research, I may write something about the maestro and his experience here. Thank you!